I nearly flunked out of university. It was the second semester of my first year that proved to be my downfall. I didn’t nearly flunk out because I handed in terrible work, I nearly flunked out because I stopped attending lectures and tutorials. At the time, I told myself I didn’t turn up to my classes because there was too much good coffee and Italian food (my DNA is 80% carb) to sample along Lygon Street (a convenient five-minute walk from campus). But if I’m completely honest, the reason I didn’t turn up to my tutorials especially, was because the thought of having to speak my mind about Classic literature, discuss my opinions about Shakespeare and generally chat with my fellow students/strangers about any topic, gripped my insides with fear. And after a few subjects of sitting in classrooms, racked with nerves as I waited to be called on to speak, my cheeks glowing red just at the thought of saying something embarrassing/stupid/obvious, I realised I was completely outside my comfort zone and I didn’t want any part of it. The university, then it seemed, didn’t want any part of me. I was sent a letter stating that unless I could argue for my continued education, I shouldn’t bother turning up the following year. As I read and reread this damning summons, I knew I had to step up. So I wrote the most convincing, pleading piece of prose I could and with a delay of six months, graduated with my degree to the smiling approval of friends and family. As for the tutorials, once I attended them regularly and realised I could more than handle myself in front of people when discussing topics I loved, my fear melted away and what I was left with was a huge sense of accomplishment and a love for learning. Almost (gulp) twenty years later, it was as if those important life sessions I’d learned at the University of Melbourne never happened. Roughly seven weeks after my arrival at Heathrow, I was sat in a taxi outside the registration office for a three-day writing festival, fittingly set at the University of York, when a familiar fear settled in the pit of my stomach. I eventually exited the cab and was momentarily distracted by the horrendous smell of the country/gardening/manure and had to laugh when I wondered if this was the smell that occurred when a group of writers got together in one place. After a light chuckle, and slight dismay that no one was nearby for me to repeat aloud this hilarious observation, I was plunged straight back into the terrifying knowledge that I’d booked myself in for an event where I would be expected to speak my mind about writing, discuss my opinions about writing and generally chat with my fellow writers about…writing and my cheeks glowed red just at the thought of saying something embarrassing/stupid/obvious. I was completely outside my comfort zone. Did I want any part of it? As I watched the taxi drive back into town, I took a steadying breath and marched towards the registration desk. Yes, I DID want a part of it. I wanted all the parts of it! Don't you want to be where everybody knows your name? 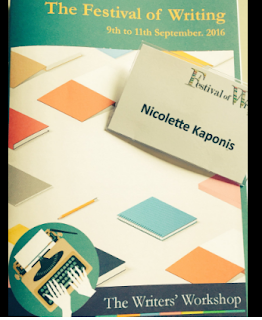 And oh thank goodness I signed up for the Festival of Writing 2016. From Friday to Sunday, I listened to inspiring and motivational keynote addresses from published authors who were gracious enough to walk us through how they managed such a feat. I listened to the wise counsel of agents who took the time to read and comment on my work, and I learned the power of a Post It note when it comes to the complicated and sometimes maddening art of the rewrite. But best of all, I met the most interesting and wonderful writers who I know I’ll be able to call on when I’m stuck in a hell known only to those people who have chosen a vocation that will send you spiralling down a dark, lonely, disorientating pit. A pit you can only escape from with the help of those who know the route back out because they’ve been to the bottom themselves. The Festival of Writing was completely outside my comfort zone and because of it, I came away not only wanting to continue my journey as a writer, but I came away wanting to be uncomfortable. Life shouldn’t be easy all the time. Sometimes, you need to have that fear in the pit of your stomach. It’s that fear that will push you to learn, to explore, to grow. Why not try something that absolutely terrifies you today? I promise it’ll be worth it.